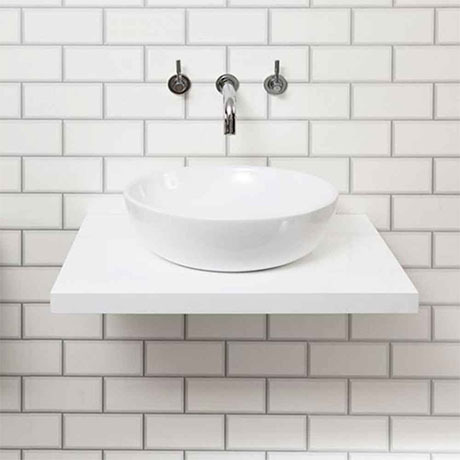 The stylish Nova wall hung counter top basin shelf features a stunning minimalist white slimline design, perfect for maximising space and for creating a boutique feel in your bathroom. Designed to be used with a countertop basin (not included). Supplied undrilled to allow flexible positioning for your basin and tap. Your products are quality. There a good price rate and great quality. I wanted a nice bathroom not just a simple one and for a good rate. This is why I choose the shelf in stead of a unit. Thought I would b different. I can't thank this company enough for the amazing bathroom I now have. Also the Facebook page was a great help and very good with response to my messages. Good quality. Could do with being longer for countertop sink. Goes really well with the basin i bought.